# This(transWin) application allows you to change opacity of any Windows Application. # What is opacity property of any Windows Application. # By default, for most of the application in Windows, opacity value is set to zero. # means completely opaque ( Zero transparency ). # Now, You can change the opacity of any top most windows application and then you will be able to see through it. # Download and run this small application/utility. 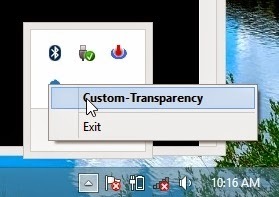 # go to tray icon of this application, and right click and select  "Custom-Transparency" tray menu item. # Now use your mouse pointer and click on any Windows application for which you want to change opacity value. # Well, i recommend you to choose either 180 / 150 value for opacity. # Enter value for opacity in Input Box and hit Enter. # that's it, you done it.